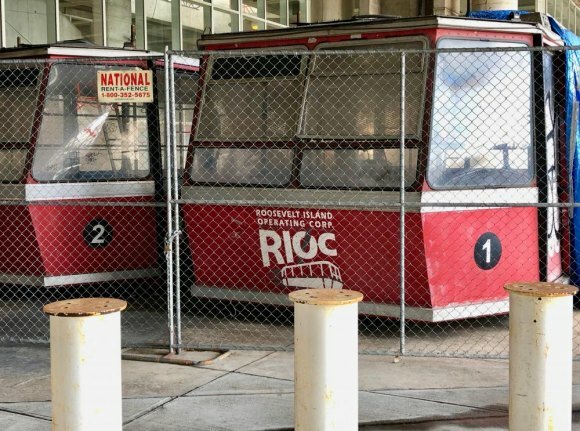 RIOC's policies abandon old Tram cabins just as as they do our neediest neighbors. "Please be advised that beginning Tuesday, March 5th, there will be new pedestrian entry and exit patterns for both the Roosevelt Island and Manhattan Tram stations," RIOC announced on Sunday afternoon. Not a big deal during an already running partial shutdown - until they stuck this in, later in the run-on paragraph: "Due to these required changes, the elevator at the Manhattan Tram station will be out of service for the next 3 weeks." That's right. RIOC gave seniors, moms and dads with strollers and wheelchair dependent residents with scant time to learn about the radical removal of elevator service, let alone to adjust medical and other appointment and other plans organized around using the Tram. RIOC's not leaving the needy completely high and dry, just mostly. "Red Bus Shuttle service will be available to and from the Manhattan Tram Station every weekday from 3 PM to 8:30 PM, beginning from the R.I. Tram Station," RIOC added, meaning if you need Tram service to get on with your life safely and comfortably, you're out of luck most of the day, overnight and all weekend. Although RIOC President/CEO Susan Rosenthal failed to respond to a request from The Daily for clarification, in the past, the State agency run by Governor Cuomo has rationalized that traffic congestion in the morning and low ridership on weekends cause restricting necessary support. But these excuses are custom built by RIOC and reflect their own neglect as much as anything else. Repeated failures to notify users well in advance have guaranteed low ridership on weekends. Often, those needing help most know nothing about it in time to make use. All residents - and especially the disabled and elderly - do not get RIOC's emailed alerts and are, otherwise, not able to adjust instantly as RIOC demands. Anyone seeing dozens of seniors line up for RIOC's Shopping Bus on weekday mornings knows that, if notices are consistent and service reliable, seniors and disabled with use it - in droves. This, of course, means that RIOC must make boarding convenient for riders, maybe at the Senior Center in the middle of town, not remotely launched from the Tram Plaza. Lack of imagination and/or flexibility seems to account for RIOC's failure to provide weekday morning support. Their collective brain trust seems to think that half-hour shuttles, predictably hampered while trying to cross on the Queensboro Bridge, are the only possible solution and, therefore, not feasible. In reality, one or two scheduled pickups, sufficiently announced in advance would do the trick, so long as those needing the service know about it and pick up points are both convenient and wisely scheduled. And if ridership is that low, RIOC could easily replicate what The Octagon does every weekend for renters - and hire cost effective mini bus operators to ferry passengers as needed. It's anyone's guess why RIOC, with resources sufficient to build a $14 million bike ramp, can't rise to the minimum needs of our most challenged residents. Suffice to say, this again represents abandonment of the State's responsibilities because they're just too inconvenient.